Rabbi Joshua Bolton of the University of Pennsylvania's Hillel center surveys damaged headstones at Mount Carmel Cemetery, Feb. 27, 2017, in Philadelphia. Jewish community centers and schools in at least 11 U.S. states reported getting bomb threats on Monday, the JCC Association of North America said, the fifth wave of such threats this year that have stoked fears of a resurgence of anti-Semitism. The threats, all of which appeared to be hoaxes, were received in Alabama, Delaware, Florida, Indiana, Maryland, Michigan, New Jersey, New York, North Carolina, Pennsylvania and Virginia. For some centers, it was the second or third time this year that they had been forced to put their threat evacuation drill into practice. “Members of our community must see swift and concerted action from federal officials to identify and capture the perpetrator or perpetrators who are trying to instill anxiety and fear in our communities,” David Posner, a director at the JCC Association, said in a statement. Jewish groups, U.S. President Donald Trump and Israeli officials have all condemned the surge in disruptive intimidation, as well as the vandalism of Jewish cemeteries. 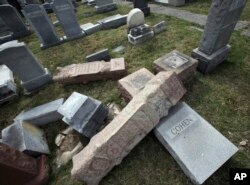 Police said on Sunday that about 100 headstones had been toppled at a Jewish cemetery in Philadelphia, about a week after a similar act of vandalism at a Jewish cemetery in St. Louis. Damaged headstones rest on the ground at Mount Carmel Cemetery, Feb. 27, 2017. More than 100 headstones have been vandalized at the Jewish cemetery in Philadelphia. White House spokesman Sean Spicer raised the subject of the vandalism at a news briefing on Monday. “The president continues to condemn these and any other forms of anti-Semitic and hateful acts in the strongest terms,” he told reporters, saying they were in breach of the country's founding principles. The Federal Bureau of Investigation and the Justice Department's civil rights division have said they were investigating the threats alongside local law enforcement, but little information has been made public so far about any perpetrators. The Charles E. Smith Jewish Day School in Rockville, Maryland, and the Gesher Jewish Day School in Fairfax, Virginia, also received telephoned bomb threats, according to a statement by the Jewish Federation of Greater Washington. Police later gave the all clear. The full tally of centers receiving threats on Monday remained unclear, the JCC Association said. NBC News reported at least 16 centers and schools had received threats. Some Jewish groups see the vandalism and threats as a sign that anti-Semitic groups have been emboldened by Trump's election. His campaign last year drew the support of white supremacists and other right-wing groups, despite his disavowals of them. Trump has said he is the “least anti-Semitic person” in the world, and noted that one of his daughters, his son-in-law and some of his grandchildren are Jewish. Muslims Ask: Will Trump Condemn Anti-Muslim Attacks as He Did Anti-Semitism?